When it comes to oral hygiene, there’s many different brands on the market, but only one of them stands out from the pack. 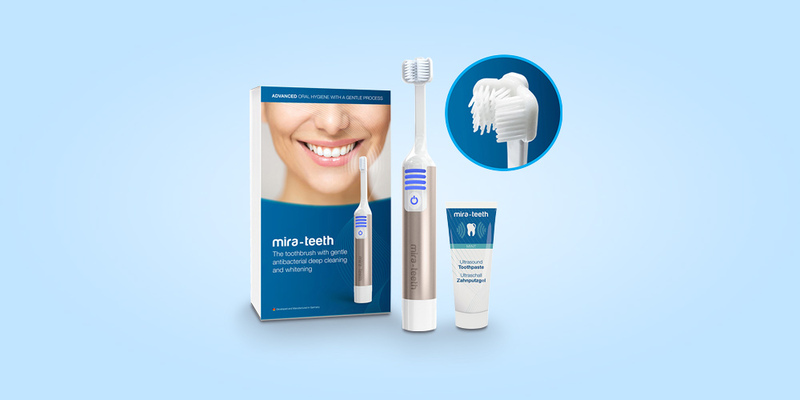 Mira-Teeth is not just another sonic brush like Oral-B or Philips. Instead of rotating brush heads, the Mira-Teeth Cleaning Starter Kit uses ultrasound technology to penetrate deeply into gums and in between teeth! This revolutionary way of cleaning your teeth is especially effective at eliminating bacteria within your gum pockets. The Mira-Teeth Cleaning Starter Kit targets and destroys microbes in areas where inflammation usually starts. Using powerful vibrations, Mira-Teeth works to clean and whiten your teeth with zero irritation. Not only is the Mira-Teeth Cleaning Starter Kit more effective at cleaning your teeth than other leading brands, but it also works much faster. You can thoroughly clean your teeth in 50% less time. It’ll only take 30 to 45 seconds to really bring out those pearly-white teeth. Originally, the Mira-Teeth Cleaning Starter Kit was 16% off, but be sure to use code MADNESS15 for an additional 15% off. That brings your total down to just $169.15!